I know this got a decent bit of media coverage last year but decided to share it on anyway - as is a great example of advertising that provides a benefit. 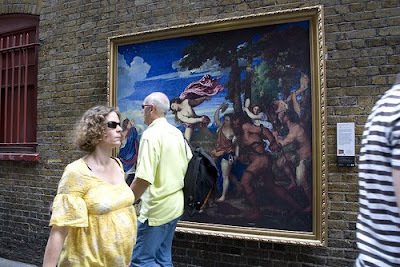 Last summer, HP reproduced some of the world's most famous paintings for the streets of London - essentially "turning the streets into a giant gallery". HP already had a strong link with the National Gallery, where visitors can pick up high quality prints of the paintings they see. HP explained that this was simply a natural extension. But a pretty creative one I think, where everybody wins. The Natural Gallery gets some nice promotion. HP demonstrate the quality of their printing. And the public get an opportunity to view some beautiful paintings and maybe develop a new interest in art (although the folks in this picture don't seem too interested). Lots more pictures and other bits and pieces at The Grand Tour site. From a brand perspective, I like this a lot. Don't tell us how good your prints are. Show us. And do something nice / useful / entertaining / good while you are at it.